Over the 23 years of Avalanche Press, both Old and New iterations, we’ve produced a lot of games. Some of them have been wildly successful on every level (Jutland). Others have been dismal failures (Airlines2). And then there are some I just don’t know how to classify. Red Russia falls into that category. It’s an intense multi-player game, with players taking the roles of the Red faction or one of three White factions. Game play is based pretty closely on our very popular Soldier Kings game, and it moves quickly despite its seemingly chaotic nature (as with Soldier Kings, you can play your cards at any time). The history behind it is impeccable; the components are very nice – it has nice big one-inch-square playing pieces, and top-quality playing cards. The rules are about as “clean” as any I can recall; as far as I can remember, there have been very few questions raised about them. I certainly had high hopes for Red Russia; Soldier Kings had been very successful for us and continues to sell well. Red Russia had a solid theme, a very good team of designer and developer, and a solid game engine behind it. It sold reasonably well, and then as sometimes happens with older games – older multi-player games, in particular – sales tailed off and now it’s the slowest seller in our lineup by a fair margin. Mostly that’s a failure of marketing and management rather than of the product itself. While we’ve given Red Russia a little Daily Content love, it’s never received as much as other games. And we never published any support materials: expansion sets, guidebooks, anything at all, even in the Golden Journal. Those additional products are vital to maintain interest in an older game, particularly on the retail level; when you fail to publish them, the game is declared “unsupported” and no longer stocked. We allowed Red Russia to become unsupported, and its sales reflect that fact. We also printed far too many of them: we printed Red Russia in Red China, and the metrics encouraged printing a lot of them, to make sure we filled a shipping container (boxes shipped outside a container being pretty much guaranteed to be crushed, smashed and torn). I ordered extra Red Russia to fill the container, at a negligible marginal cost. Well, except for storage. We’ve stored them now for something like nine years. At one point we decided to get rid of Red Russia, and I thought we actually did. Then we found even more components still in storage, and so we printed more rulebooks and charts and put it back on sale. We sold a few, but not many. We still have them. So here’s what we’re going to do. We’ll dispose of the color components still in the warehouse: boxes, maps, playing cards, playing pieces. We’ll slash the price on the complete games yet again, to $9.99, our lowest practical price – below that, we don’t recover our costs to process an order, and even then it’s questionable. When the complete games now on hand are gone, then that will be the end for Red Russia; we won’t reprint it. 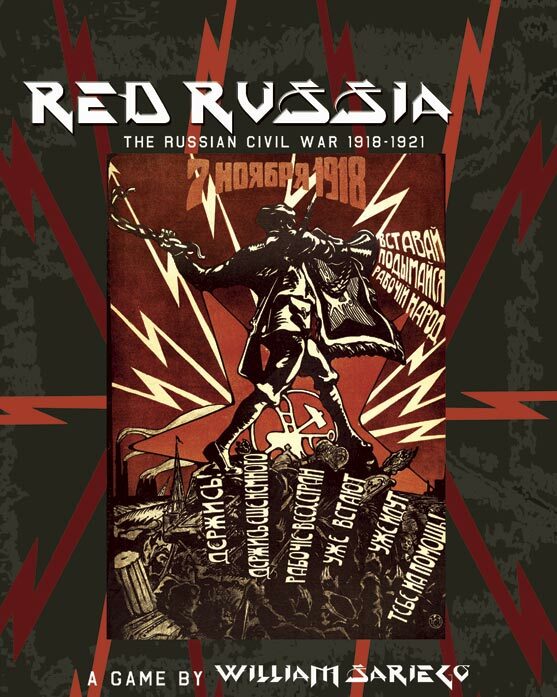 You can order Red Russia right here for just $9.99, while it lasts.